Kauhale Makai Resort (Village by the Sea) ha appena completato un importante progetto di miglioramento. Ci sono alcuni lavori di architettura in corso. Vieni a goderti il nuovo resort. Il nostro condominio splendidamente ristrutturato a Kauhale Makai è il luogo perfetto per venire a godere di tutto ciò che Maui ha da offrire. Il condominio al primo piano ha pavimenti in piastrelle in tutto, doccia piastrelle, arredi di grandi dimensioni ed è in perfette condizioni. La cucina dispone di contatori di granito, tutti i principali elettrodomestici ed è molto ben attrezzata con stoviglie. Cal King letto !. Wifi gratis. Parcheggio gratuito! Il condominio è situato sul lato "interno" preferito del Plumeria Building, con facile accesso alla piscina, vasca idromassaggio, barbecue a gas e putting green. Giardini ben curati circondano il Resort. Le spiagge di Kamaole sono a circa due chilometri a sud di Kauhale Makai. Gli ospiti sono invitati a utilizzare i campi da tennis adiacenti al resort. Kauhale Makai è situato in posizione centrale vicino a diversi campi da golf, punti di immersione, ristoranti e negozi. Per chi è interessato al windsurf, kitesurf o stand-up paddling questa è una posizione ideale, il lancio di fronte alla proprietà (tempo permettendo). Il tuo concierge personale è disponibile nella Lobby per aiutarti a prenotare le tue attività di Maui. No recensioni settembre 2015 - agosto 2017 come avevamo un inquilino a lungo termine. Si prega di e-mail o chiamare per ulteriori informazioni. Vieni a goderti il ​​paradiso !! Maui - No Ka Oi !! Maui è il migliore !! Clean, well stocked, great location. The condo was convenient to the pool and grills, also easy access for bikes and walking out back to view beautiful sunsets over the water. The water for showers wasn’t hot which was the only negative. Buzz was very responsive and it improved but still not hot. Seems to be an issue with being in the ground floor. We had a great vacation there. Awesome condo, with perfect location and amenities. This was our first visit to Maui and this condo was perfect for our 3 week visit. The condo is well appointed with plenty of towels, spare sheets, kitchen accessories (including some basic food stuffs), beach accessories (umbrellas, coolers, chairs) and a super comfy king sized bed. Being a ground floor condo, it has easy access to the bbqs and pools, as well as a short walk to the ocean to watch the stunning sunsets Maui offers. Also the condo is centrally located for exploring the entire island. We also had the opportunity to meet Buzz, who gave us some great suggestions of where to eat (all of which we tried!). We had a wonderful vacation and would highly recommend this condo to everyone! Mahalo Buzz and Alex! Thank you for your review. We are so glad you enjoyed the condo and your time on Maui! 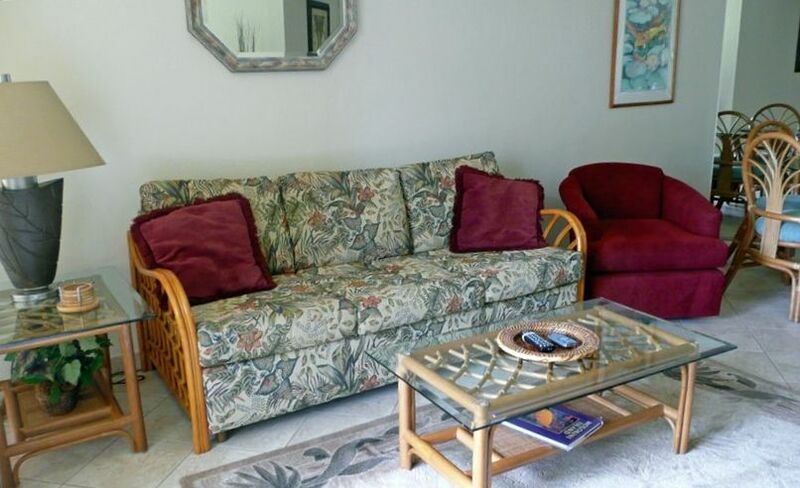 Comfortable, Quiet and steps from the beach! Loved staying here. The place was so quiet. Everything I needed was provided in the unit. Steps away from the beach and a beautiful sunset every night. So grateful I found this place. So glad you enjoyed your stay! Thank you for taking the time to write a Review. Fantastic location and everything you could possibly need/want. First time Maui visitor and I am so glad I chose Kihei to stay and I was very fortunate to have chosen this place out of the many available. Everything you need to make your stay enjoyable including beach chairs. Very clean and up to date and the fact that it’s a ground floor unit is a big plus. Being able to walk right out my door to the pool, beach, barbecue, etc was a feature I would look for again going forward. The North Kihei location makes for the ideal place if your looking to explore the island and if you don’t want to go anywhere, the best beaches on Maui are in Kehei and Wailea. Either way it’s the best location on island for your stay on Maui. The property was convenient, next to the new beach and perfect for what my husband and I wanted! The condo was clean and had everything we needed and could want. It was nice that there was coffee already in the cubbord! It was also great to have everything we could need for the beach, I will definitely be referring some friends! We are so glad you enjoyed your stay! Thank you for referring your friends, we appreciate it. Thank you for taking the time to write a Review. Perfect place to stay on Maui! I cannot say enough good things about our stay at Buzz & Alex’s condo at Kauhale Makai! The condo itself is well appointed with supplies, including a great beach umbrella & chairs (don’t overlook the cooler pouch on the backs!!). The complex is nice & offers a beautiful beach area to watch the sunrise/sunset. The owners made us aware before booking that there would be construction going on around the complex during our stay, but it did not bother us a bit. We were only around for about an hour one day during work hours, & to us it was neither loud nor disruptive. The location is AWESOME, especially if you’re planning to venture all over the island and don’t have the time to split your stay between the north & south ends. Wailea- Makena area was only 15-20 mins away, Kameole beach less than 10 mins, 20 mins to the airport/ Paia, about 45 mins to an hour to get to Lahaina & beyond on the north end. (If you drive the road to Hana, you’ll be grateful for the hour it cuts off your drive vs staying on the northwest side of the island!!) This condo is an absolute bargain without feeling AT ALL like a budget property. We hope to come and stay again sometime! Thank you so much for a fun wonderful week in paradise! We are so glad you enjoyed your stay in the condo! Thank you for taking the time to write a Review. La strada per Hana, alba a Haleakala (prenotazione obbligatoria), balena (stagionale dicembre - marzo), acquario del centro oceanico di Maui, città storica di Lahaina, stand up paddling, kayak, windsurf, kitesurf, la fattoria Kula lavender, la cantina Upcountry sono solo alcune delle cose meravigliose che puoi esplorare e sperimentare su Maui.